Note : To obtain an aligned printout please download the (781 kb) version to your machine and then use respective software to print the story. 1.2 In order to implement this announcement, the Reserve Bank is introducing an online application, FIRMS (Foreign Investment Reporting and Management System), which would provide for the SMF. FIRMS would be made online in two phases. In the first phase, the first module viz., the Entity Master, would be made available online. Instructions in this regard were already issued through A. P. Dir. Series Circular No. 30 dated June 07, 2018. 1.3 In the second phase, the second module containing 9 reports would be made available with effect from September 01, 2018. With the implementation of SMF, the reporting of FDI, which is presently a two-step procedure viz., ARF and FC-GPR would be merged into a single revised FC-GPR. The SMF also introduces reporting of indirect foreign investment through form DI and reporting of inflows in investment vehicles through Form InVi. Further, the reporting in FC-TRS, LLP-I, LLP-II, ESOP, DRR and CN would also be made in SMF only. The finalized structure of SMF and operational instructions thereof would be made available in the Master Direction on Reporting under FEMA, 1999. 1.4 The first module will be available to the public for data entry between June 28 (at 1:00 PM) and July 12, 2018. The date was extended till July 20, 2018. 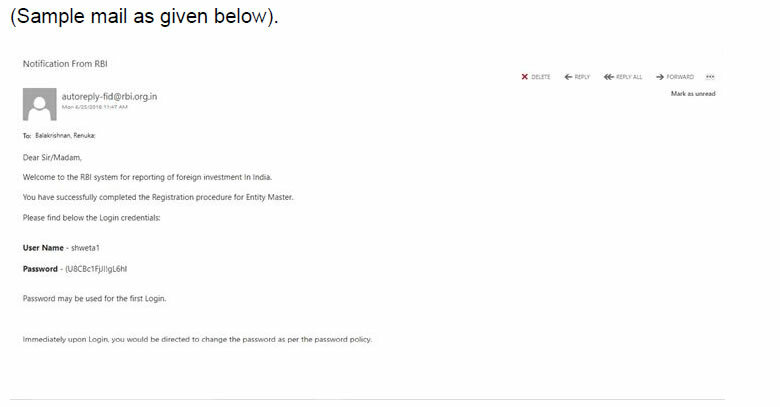 It would provide an interface for Indian entities [as defined in Foreign Exchange Management (Transfer or issue of security by a person resident outside India) Regulations, 2017 dated November 07, 2017 and as amended from time to time] to input their existing foreign investment (including indirect foreign investment) data. Entities shall provide data with respect to all foreign investments received, irrespective of the fact that the regulatory reporting to the Reserve Bank for the same has been made or not and whether the same has been acknowledged or not. 1.5 Indian entities not complying with these instructions will not be able to receive foreign investment (including indirect foreign investment) and will be treated as non-compliant with Foreign Exchange Management Act, 1999 (FEMA) and regulations made thereunder and liable for action as laid in FEMA or the regulations made thereunder. 1.6 Where the entities have not been able to register for the Entity master, they may do so from September 01, 2018. However, they may provide the reasons for not registering within the time period along with the authority letter. 1. Who is an Entity? 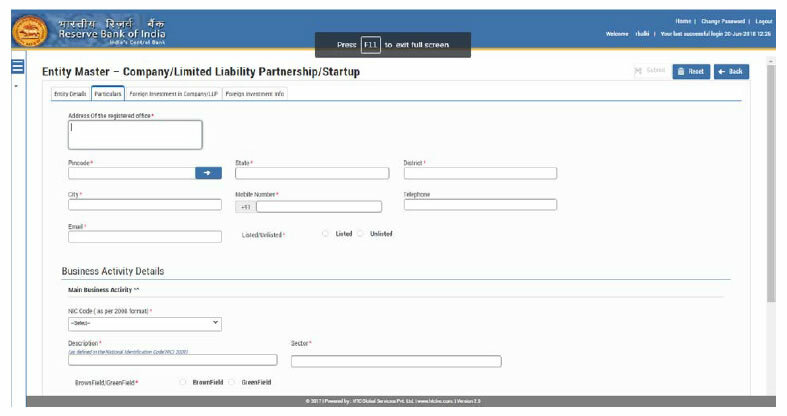 An Entity User is a person authorized by the entity (company/ LLP/startup) to register an entity in the Entity Master of FIRMS application. The Entity User would be the sole person authorized to add/update the foreign investment details of an Entity in the Entity Master and would be entirely responsible for the data entered. One entity can have only one entity user. If the entity wishes to change the Entity user, it may contact RBI helpdesk, the details of which are available under “Contact Us”. One person can also be an entity user for more than one entity. However, the person has to obtain separate registrations for the same as the registration is entity specific. • Authority letter: The entity may issue an authority letter, in the format as given at Annex to the identified personnel authorizing him/her for registering as an Entity user for the entity. • The Entity user may keep ready all details of foreign investment in the entity. • The person, for registering as Entity User, may access the login page of the FIRMS application using the above URL on the internet. 4.4 Creation of new Entity user. 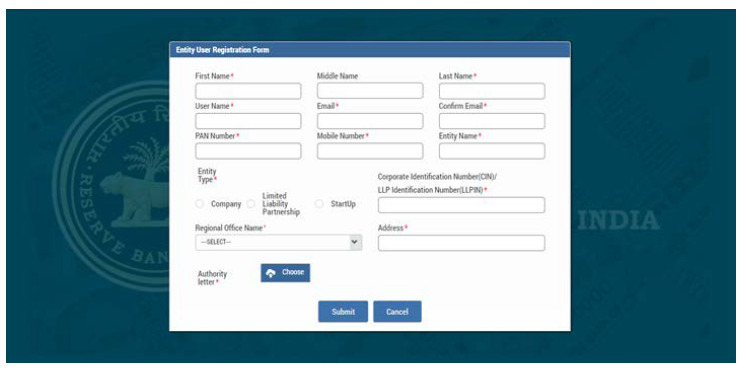 Step 2: A pop-up box showing Entity User Registration form opens. Step 3: Fill all the details in the Entity User Registration Form. The fields in the Entity User Registration Form are described in the following table. User Name* User has to enter a unique username. The user can use alphabets & numerics. Email* The user has to enter valid e-mail ID. The default password will be provided in the e-mail ID. PAN number* The user should provide their own PAN No. (not the PAN No. of the company). It consists of 10 characters (first five alphabets, next four numeric and the last alphabet). Mobile Number* The user should enter its valid 10 digit mobile number. 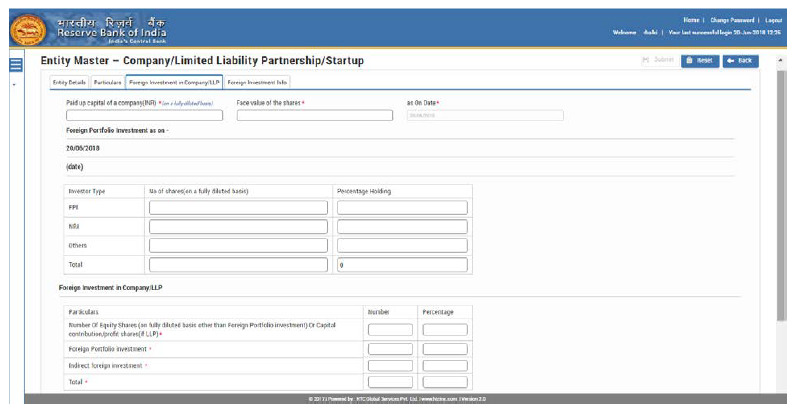 Company Type* Entity type whether Company, LLP or Start Up. Regional Office Name* Regional Office of RBI under whose jurisdiction the registered office of the entity falls. Address* City with PIN Code of the registered office of the entity. Authority Letter* The user has to attach the authority letter from the entity authorizing the person to register as the Entity User for submission of information in the Entity Master. The format of the authorization letter is provided in Annex. Only a .pdf file can be attached. Step 4: Click on Submit button after filling all the details. Step 5: Message “Record Saved Successfully” pops up. User has created its user ID. Authority Letter submitted by the entity user will be verified by RBI and after RBI’s approval, the user will receive the password on their registered email ID from RBI email ID autoreply-fid@rbi.org.in. 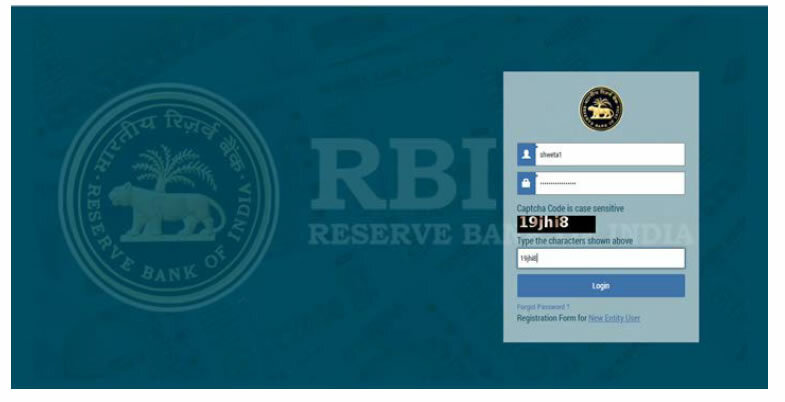 Step 1: Enter User Name and Password as provided to the User in the email from RBI and click Login. The user would be asked to change his/her password upon first Login. Step 1. The Change Password window is displayed. Step 2. Enter your old password in the Old Password field and new password in the New Password field. Step 3. Re-enter the new password to confirm it and click continue. Enter your user name and new password. 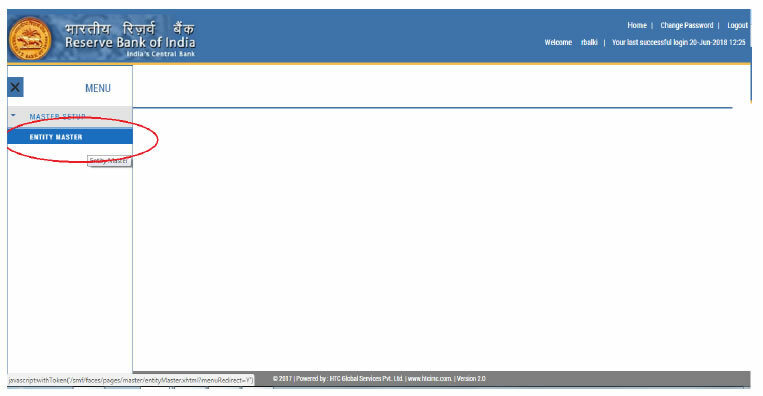 On successful login the home page (dashboard) is displayed. Step 1: Click on the top - left option button to open Menu. The fields in the Entity Details are described in the following table. RBI Registration Number The number provided by RBI during reporting of earlier allotments, if any, has to be entered. Whether the company/LLP is under investigation by Directorate of Enforcement/CBI or any other investigative agency for violation of FEMA, 1999* As the case may be for the entity. Please add the pin code nearest to your area in case the pin code specific to your area is not displayed. The fields in the Particulars tab are described in the following table. Mobile Number* Mobile No of the authorized person e.g., Director, Company Secretary for the Company etc. 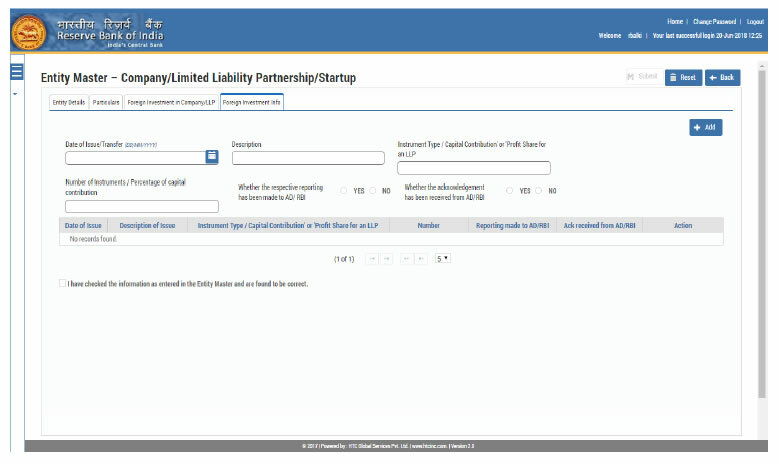 Step 6: Click Foreign Investment in Company / LLP Tab. 5. The Indian companies who have made downstream investment in another Indian company for which it is considered as indirect foreign investment in terms of Regulation 14 of Foreign Exchange Management (Transfer or issue of security by a person resident outside India) Regulations, 2017 dated November 7, 2017 and as amended from time to time, shall inform the same to the Indian investee company for the purpose of providing details of indirect foreign investment in Entity Master. The entity should also report indirect foreign investment received by it. The entity shall provide the details of all foreign investment as on date on an aggregate level as below. This will also be inclusive of all foreign investment, irrespective of the fact that the regulatory reporting to RBI for the same has been made or not or whether the same has been acknowledged or not. The fields in the Foreign Investment in a Company/ LLP tab are described in the following table. Foreign Portfolio Investments made (value of shares, where value of shares = number of shares * face value) by Foreign Portfolio Investors (FPI)/ Non-resident Indian (NRI). Foreign Portfolio Investment* Foreign Portfolio Investments made by Foreign Portfolio Investors (FPI) / Non-resident Indian (NRI). Note: The companies which have already filled in the data in the Entity Master, prior to July 20, 2018, may please check that the values in data fields as being reflected are correct with respect to the value of shares and percentage holding. The fields in the Foreign Investment Info tab are described in the following table. Description Description of the allotment/transfer (whether Rights / Bonus / Share Swap / Merger / Demerger / ESOP/ NR to R transfer/ R to NR transfer etc). In case of LLP, percentage of capital contribution received from the foreign entity to be provided. Step 8: After all the issues / transfers have been added, user will have to click the declaration check box to enable submission of the entity master. Step 9: Only after the declaration is checked, the entity user can submit the details. Once the details of the company have been submitted it will be available on the Entity Master page. No email acknowledgement would be sent for the submission in the Entity Master. 6.1 All details must be provided in one go. 6.2 Only when all the mandatory fields have been filled, the submit button is enabled. 6.3 The RESET button will reset the complete form. 6.4 Once the details have been submitted the Entity user can modify the details. 6.5 The onus of the integrity of the data entered is on the Entity user. 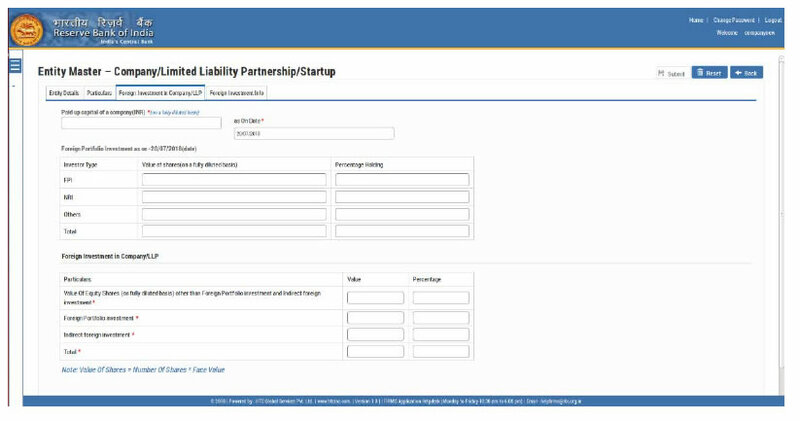 Helpdesk for FIRMS to receive queries from stakeholders regarding entries to be made in FIRMS or to raise any issues encountered while creating/ updating the Entity Master. Telephone Number (022 – 22601000 - Extn: 2617). 1 In case of rejection of a registration, use another User Name for fresh registration (other than the one given earlier). 2 While logging in, manually type the User ID and Password (Kindly do not copy & paste). 5 Nominated person and Authorising person should be different. 6 Authorisation letter should be dated on or after June 28, 2018. 10 Name of Authorised person in Registration form and Authorisation letter should be same. 11 CIN / LLPIN given in the Registration Form and Authorisation letter should be same. 14 Seal/Stamp of Company/ LLP should be affixed. 16 Attached pdf should be readable. 17 Valid e-mail ID should be filled in the Registration Form to ensure receipt of User ID and default Password. 18 Entity User should provide Specimen signature in the Authorisation letter. 1 While logging in, do not Copy & Paste the User ID and Password, the same should be typed out. 2 The authorisation letter cannot be signed by the person nominated by the company. It should be signed by another person from the company as given in prescribed format.